Applications to serve on the Springville Youth Court 2018/2019 are being accepted March 2019 through April 2019. Springville Youth Court received their certification from the State of Utah in July 2015. The court is made up of Springville and Mapleton residents ages 14 to 18 in grades 9-12. They hold the positions of mentor, clerk, bailiffs and judges. 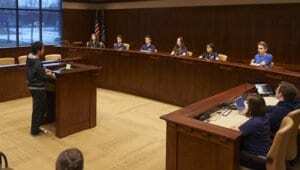 Springville Youth Court is based on restorative justice. Youth Court volunteers deliberate and come to a consensus on a disposition (sentence). The disposition’s goal is to provide accountability, skill development and/or a community connection for the offending juvenile. This allows juvenile offenders who have committed their first offense, and the offense does not rise above a Class B Misdemeanor, to appear before a court of his/her peers. What is the benefit of appearing in Youth Court? By attending and successfully completing all requirements a juvenile offender does not appear in Juvenile Court and will maintain a clean criminal history. What are the requirements to appear in Youth Court? How does Youth Court benefit the community? Youth Court volunteers are trained in restorative justice, prevention and the legal process. They are given the opportunity to be community leaders. Juvenile offenders who appear before the court may be given the opportunity to serve on the Youth Court once the disposition is complete. Youth Court is under the direction of Springville City’s Legal and Prevention department. Springville Youth Court may decline to accept a youth for disposition or may terminate a youth from Youth Court participation at any time.